This is a very atypical week around Balancing Beauty and Bedlam because it’s my Huge Back to School Giveaway Bash. So, the highlight of this post is solely going to be YOU (and your amazing recipes)!!! I’ve been cooking up a storm this week because I have unofficially been dubbed the “team mom” of our high school boys football team and I have fed a crew of HUGE EATERS the last four out of five nights. (I should say, team mom without the pressure of organizing details, that’s been done by other wonderful women, that’s why it’s very unofficial. :)) Yes, feeding this crew has taken me, and our food budget by surprise as well, but I want this to be a place where everyone feels welcome. Yes, I guess they do, and I LOVE it. 🙂 Guess what we did that one free night, which happened to be my hubby’s birthday? We went to one of my favorite places – the Cracker Barrel. Thank you for hosting! Hope your bash goes well! It is hard to believe that it is back to school time already. I appreciate all of your giveaways!! I love to come back and look at all the awesome recipes, thank you so much for hosting!! Ooooh, I love tapmops! 😉 Thanks for hosting! @Phoebe @ GettingFreedom, You have a really good excuse…post pregnacy brain will do that to you . Did you figure it out yet? Thanks for the linky party AND all the fun giveaways! I was very curious about the baked oatmeal and a couple other recipes but when I click the pictures they don’t link any where?? 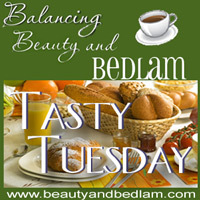 @Dianna, Hmmm….the recipes linked up today in our Tasty Tuesday round up? I just clicked on the picture of the Baked Oatmeal and it took me right to the recipe. Maybe try again. It could have just been a glitch. With all that cooking, I think I would be taking a night off too! Thanks for having all of us…and the coupons! Our kids don’t go back to school here until early September, so we still have a bit of summer left, although you wouldn’t know it most days to look at the weather as it is getting distinctly autumnal here in the south east of England! Thanks for hosting another great Tasty Tuesday – I’m looking forward to visiting the delicious looking links! Jen, Thanks so much for hosting this. Sounds like you are in the middle of a crazy busy time. As my kids get older I keep hearing the advice that you want to be the house they all come to…. Which sounds like a great investment. Have a super week!!! PS we love Cracker Barrel too!! I have found some of the best recipes on your Parade of Foods. Thanks for hosting such a great party! Thanks for the give computer giveaway. I love your blog. I can’t remember how I found it, but it is one of the handful I read. I have gotten some great ideas. I usually just lurk, often while nursing baby #5. If we win the computer it will probably deploy with my husband in Oct.
As usuall I glean so much from your Tusday link up. I’m writing this as 10 windows are loading!! Blessings during football season – I’m sure the boys will remember this forever! I love Cracker Barrel. And, what do you feed a team of hungry football players? !